ADSelfService Plus supports Active Directory (AD)-based single sign-on (SSO) for Zendesk and any other SAML-enabled application. Upon enabling SSO for Zendesk in ADSelfService Plus, all users have to do is simply log in to their Windows machines using their AD domain credentials. Once logged in, users can securely access Zendesk in one click without having to enter their username and password again. ADSelfService Plus supports both Identity Provider (IdP) and Service Provider (SP)-initiated SSO for Zendesk. IdP-initiated SSO for Zendesk: Users need to log in to the ADSelfService Plus self-service portal first, and then click on the Zendesk icon on the Applications dashboard to access Zendesk. SP-initiated SSO for Zendesk: Users can access their Zendesk domain via a URL or bookmark. They will automatically be redirected to the ADSelfService Plus portal for login. Once they've signed on, they'll be automatically redirected and logged into the Zendesk portal. With ADSelfService Plus, you can use the existing AD domain credentials of users for authentication during SSO. So, first you need to configure an AD domain in ADSelfService Plus to enable SSO for Zendesk. Click Zendesk in the list of applications provided. In the pop-up that appears, copy the Login URL, Logout URL, and SHA1 Fingerprint values. Configuring SSO settings in Zendesk. Go to Settings, and select Security and then Single Sign-On (SSO). 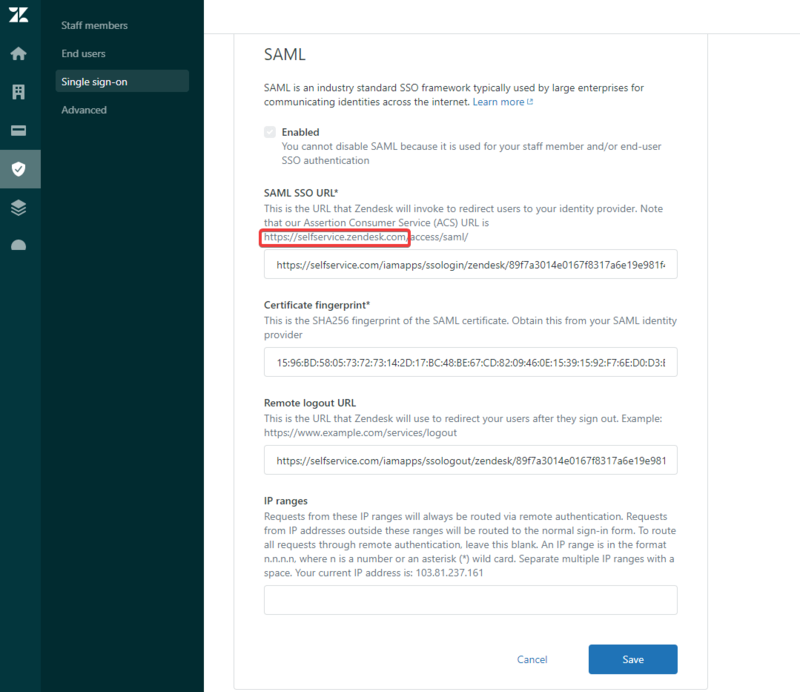 Select the Single sign-on (SSO) check box followed by the SAML check box. In the SAML SSO URL field, enter the Login URL from Step 12. In the Certificate Fingerprint field, enter the SHA1 fingerprint from Step 12. In the Remote Logout URL field, enter the Logout URL from Step 12. Note down the Assertion Consumer Service (ACS) URL displayed below the SAML SSO URL field. Adding your Zendesk domain in ADSelfService Plus and enabling SSO. Now, switch to ADSelfService Plus’ Zendesk configuration page. In the SAML Redirect URL field, enter the ACS URL from Step 19. In the Domain Name field, enter the domain name for which you just enabled SSO. For example, if you use johndoe@thinktodaytech.com to log in to Zendesk Online, then thinktodaytech.com is the domain name. Your users can now log into their Zendesk accounts automatically using single sign-on.